Rituxan (rituximab) is an incredibly successful drug for Roche, generating billions of dollars across multiple indications each year. Roche’s U.S. sales force interacts with 6,500+ physicians, with effort split primarily amongst oncologists (blue) and rheumatologists (red) as pictured below. However, Rituxan faces a U.S. patent expiry in 2018…opening the way for biosimilar competition. Enter Roche’s next-gen agent, Gazyva. Like predecessor Rituxan, Gazyva targets CD20 to directly attack cancer cells. Roche’s scientists have engineered Gazyva to be more active than Rituxan, which has translated to a clinical benefit within oncology indications (i.e., CLL, NHL)…serving as a point of differentiation over both the innovator and future biosimilar copycats. Roche’s launch of Gazyva presents an interesting case study around a “next-gen” drug roll out. We’ve used the MDDetails platform to isolate the November 2013 launch of Gazyva into oncology indications (depicted below). 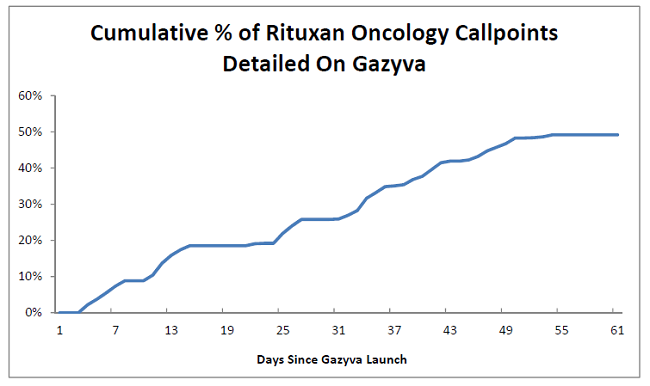 Note that the static black points indicate Roche’s existing oncology footprint to support Rituxan and the dynamic red points indicate physician detailing activity for Gazyva. The incredible speed of Gazyva’s commercial roll out highlights the distinct advantage offered by a deep understanding of the market and prescriber accessibility prior to launch. Roche already knew many of the target physicians and practices from years of prior experience with Rituxan. However, the drug was approved in early November 2013, leaving just ~60 days before the major U.S. holiday season. 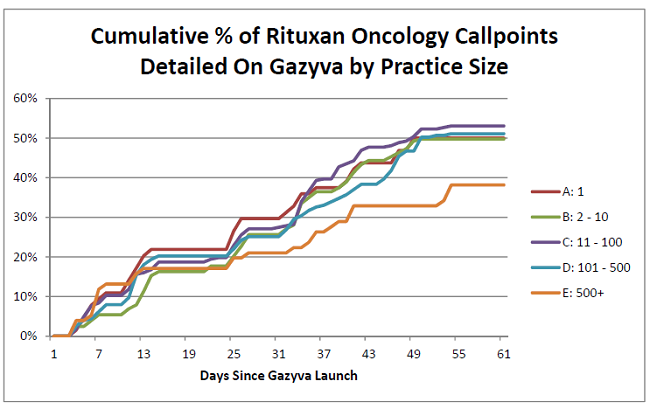 In the figure below we highlight the cumulative percentage of Rituxan callpoints that were detailed about Gazyva within the first two months of launch. Roche was able to detail more than half of the target prescribers despite a challenging launch time frame. (Note: plateaus generally correspond with weekends and vacations). To take the analysis one step further, we’ve broken out penetration by organization size (e.g., small vs. medium vs. large practices). Note that the smaller organizations tend to be private practice/community hospitals while the larger represent hospital networks or academic institutions. Interestingly, Roche performed well across all shapes and sizes. The one minor exception looks to be within the largest institutions (e.g., staff of >500) where penetration lagged. This lag is likely a symptom of increased restrictions around detailing/use of new therapies within large provider networks. MDDetails has tracked dozens of recent U.S. launches and can offer actionable insights that serve to optimize physician engagement within this critical phase of the product lifecycle.